Opportunities to Volunteer for the Park You Love! Please wear sturdy shoes on all volunteer activities -- flip-flops are NOT allowed! Bring plenty of water and a high-energy snack. All times shown are Central Time. ​ Click on the location listed with each item below to get an interactive map to that location. For a list of Park trailheads & maps to each, visit our trailhead info page. Also check the Friends' MeetUp page for the latest on all volunteer activities. DOG POLICY: Dogs are OK at trail maintenance activities, but must remain tethered on a leash. All volunteers must have a completed Liability Release Form on file (more info here). 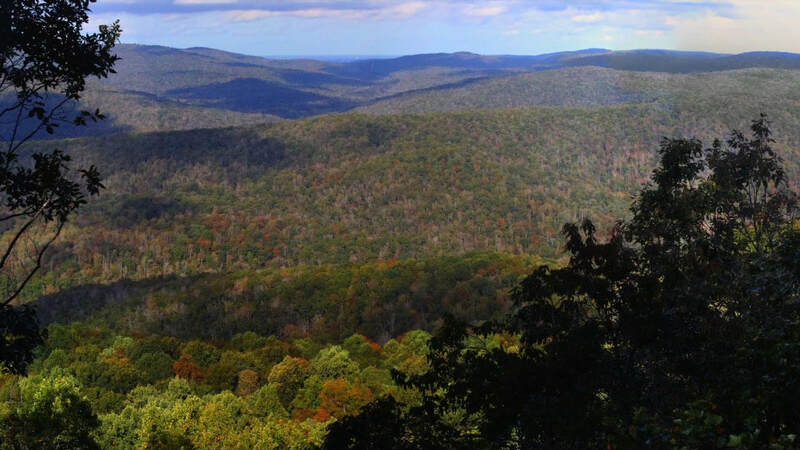 Tennessee State Parks and the Tennessee Department of Environment and Conservation need your help! Before you volunteer for your next activity in the Park, TNSP and TDEC urgently request that you download and complete a Volunteer Liability Release Form. You will only need to do this once; the Friends, and the Park, will keep it on file for as long as you are an active volunteer. Thank you for your time, and for all you do in support of the Park! The view from one overlook on the new Sherwood Day Loop Trail. Meet at the Sherwood Forest Trailhead. Ranger Jason Reynolds is back at it! This is the season to finish the new Sherwood Day Loop Trail in the recently-acquired Sherwood Forest area of the park! It's about 15 minutes south of Sewanee, off Jumpoff Road. The trail passes by and even through some amazing rock formations, with great views of the Tom Pack and Crow Creek valleys! Check out this new video about Sherwood Forest and the Day Loop Trail Build, and then meet Ranger Jason at what will become the trailhead for this amazing new 2-mile day loop trail, with incredible bluff views! Click here for a Google Map to the location, which is about 15 minutes south of Sewanee, off Jumpoff Road. NOTE: You can only access Old CCC Road from Jumpoff Road; NOT from Sherwood Road! There are jobs for everyone, and many do NOT involve moving rocks! Please be prepared with sturdy footwear and plenty of water/snacks. If you have favorite trail-building tools or pairs of gloves, feel free to bring them. Ranger Jason periodically works on the trail on other days, too; email Jason for more information! Join South Cumberland Ranger Mark Greenwood for a day of trail repair and maintenance at the Savage Gulf State Natural Area. Bring work clothes, sturdy footwear, gloves, plenty of water, and food for the trail. Work implements (hand tools only) will be provided. Weather permitting. Meet at 8:15 AM CT at the Savage Gulf South Trailhead (Savage Ranger Station) 3157 SR 399, Palmer, TN 37365. • Volunteers will not use power tools; hand tools only. Exception: If you have a recognized chainsaw certification, you may use a chainsaw IF all of the following conditions are met: you bring a copy of your certification for the Ranger to keep on file, you bring your own chainsaw and associated equipment, and you bring [and use] all personal protective equipment which includes, at minimum, chaps, eye protection, ear protection, gloves, and hard hat. • Volunteers will be required to sign a Volunteer Form, which may include a liability waiver. • Inherent Risks: As is understandable, trail maintenance and the use of hand tools, etc., carries certain inherent risks. These include, but are not necessarily limited to: accidents involving the tools; potential exposure to the elements and wildlife; and all-around, general hard work. The Friends of South Cumberland State Park, in conjunction with our park manager and rangers, have an exciting new volunteer program, called “Trail Friends,” taking place at popular trailheads in the park. The Friends are looking for people who want to become knowledgeable about the most popular trails in the park. “Trail Friends” will be stationed at these trailheads during periods of high visitor traffic to welcome hikers, provide information and answer questions about that particular trail. Volunteers are now being accepted for the Spring, 2019 season. If you would like to become a Trail Friend, click here to learn more!